GeekOut Meetups are coming to town. Spooky scary skeletons send shivers down my spine, whilst sticks and stones may break my bones, the geeks will be out this night. Yes it’s true, GeekOut Bristol Meet is taking place once more in our favourite haunt, the Old Market Tavern. So come join us as we shake down the skeletons that make up the next meetup. We promise we won’t get up to too much mischief. 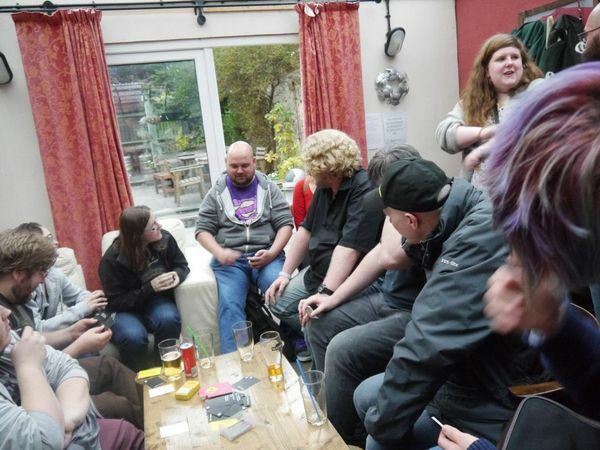 A blast from the past was had by all of the attendees of the GeekOut Bristol Meet this month. Taking place on Friday 8th, we went back in time to an earlier era of video games, with many appearances from characters such as Mario, Donkey Kong, Space Invaders and more. With a huge competition taking place this month, courtesy of our sponsors and venue the Old Market Tavern, it was a massive event. Join Timlah for a full run down of what went on! Our latest meetup has now come and gone, another month of geeks getting together to celebrate all that’s geek has passed us by. But it doesn’t have to end there – We got some pictures, we shared some stories, we met new people and old friends. So join Timlah as we look back at this past weekends meet.